To stay on top of the blog, I make a concerted effort to write my posts as soon as possible after making a recipe. I like to cook, photograph, and write within 24 hours. Otherwise, I get disorganized. And when I get disorganized, there’s no help for me. I am just now starting to make sense of the mess of recipes that have been accumulating both on my computer desk and in my “drafts” folder since the end of last year. What I’m finding is that I’m lucky if I remembered to make some kind of comment, no matter how cryptic, to provide useful insight or commentary on the recipes. More often than not, I didn’t. I’m talking about months’ worth of cooking and eating commentary, gone forever. I’ll be honest, my first inclination is to freak the hell out. 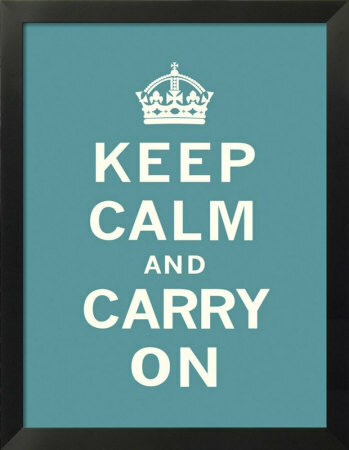 But thanks to the savvy marketing of Keep Calm and Carry On, I can let the stoic British spirit be my guide. So what if I don’t have a picture, or a bit of wisdom, to append to my post. I must carry on. So no, there is no photo available for applesauce spice cake. Besides, what you really need in order to fall in love with this cake is scratch and sniff. Sure it’s a beauty to behold but the aroma of the spices is the real show stopper. BAH Note: I made this in a 9 inch round cake pan but according to my pal Beth at 990 square, there is enough batter to make a full size bundt. Either choice you make, you can’t go wrong. Heat oven to 350 degrees and spray your cake pan with a nonstick spray that includes flour. If using a round cake pan, you can also line the bottom with a piece of parchment. Whisk together the flour, baking powder, baking soda, salt, and spices in a medium bowl. In the work bowl of a stand mixer fitted with the paddle attachment, cream the butter, brown sugar, and vanilla until pale and fluffy, approximately 2 to 3 minutes. Add the eggs, one at a time, beating well after each addition. Add the applesauce and mix to combine. Reduce the mixer to low speed, add the flour, and mix until just combined. Spread the batter into your prepared pan and bake for approximately 35 to 40 minutes or until a toothpick inserted in the center comes out clean. Cool the cake in the pan for 15 minutes then turn the cake out onto a rack to cool completely before frosting. In the work bowl of a stand mixer fitted with the paddle attachment, beat the cream cheese, confectioner’s sugar, and vanilla until fluffy. Add the half and half slowly until the glaze is your desired consistency. Spread on top of your cooled cake and garnish with the allspice. Ut oh – sounds like you have a mild case of RDD. But I can’t feel too sorry for you – I am too busy being impressed with how far in advance you schedule your posts. And I’m distracted by the idea of this cake with the cream cheese icing. Cream cheese icing is delightful. Jennifer, I wish I could blog in real time. Now maybe it will make sense why I’m talking about my Christmas Dinner Rolls in April? Maybe not. Yes, thinking about cream cheese icing is distracting. The only remedy is to make some. so i know this is more of an autumn cake but honestly, i adore me anything apple, any season. personally, i would chunk the hell out of this cake, i like the texture. Lan, I think a good applesauce cake is seasonless. I used to live by the “don’t post without a photo” philosophy. But seriously, if that were the case some of these things would never get posted. A girl’s gotta do what a girl’s gotta do to keep the content fresh. Honestly, I’d rather forgo the cake and just make the glaze. Not a big fan of spice cakes but I’d be all over that glaze. Brooke, that glaze would make cardboard taste good. This past Monday, I had some time to kill on my lunch break so I walked up and down every single aisle at Whole Foods. I ended up buying a jar of unsweetened applesauce. I NEVER buy applesauce. I never think to, at least. This recipe was meant to be. See? Photo totally not necessary. Ali, I think perhaps The Universe had a hand in you picking up that applesauce. Carry on girl. I think this cake sounds great. I loved spiced cakes, and the cream cheese glaze just makes it sound that much more wonderful. I know what you mean about writing a post right after making a dish. I have to do that too, because if not I forget what the heck I did, what variations I made, and what my real opinion on the flavor was. What takes me a little longer is processing the pictures and getting them inserted in the post in the correct places. Sometimes I just don’t feel like having an hour-long date with Photoshop. . .
Jenna, you mean I’m not alone in having a possibly unhealthy relationship with Photoshop? There are others like me? I can only imagine how long my Photoshop dates would need to be if I did more than one picture per post. My hat’s off to you. The cake sounds perfectly wonderful but what I enjoy most is your decision to not be bound by the ‘rules’ of blogging and decide to not share a recipe without a photo. I would be hard pressed to use a lot of my cookbooks if I kept that rule! I started putting recipes online mid 90’s and have a bunch of them on my blog from the very early days that are many of those recipes without attendant photos. I wasn’t about to recreate hundreds of things at one time and yet, I want them there. Part of my blog is for me, my recipe box as it were! Besides now is a good time to connect with all things British…it’s a Royal time! Barbara, I am a fan of doing what works even if it goes against the norm. Sometimes, I even revel a bit in being “different”. I love that British motto to live by. Definitely going to frame it and hang it somewhere when I get a house. It’s crazy you have a four month blog backlog Wendi, mine is about 3 weeks right now! (stupid work getting in the way of posting!). The backlog is my salvation. Blogging in real time is great but it terrifies me. What if I want to take a week or two “off”? Thanks to the backlog, I can take a break but I still have new content posting. It’s how I Carry On…wait, that sounds kind of weird. But you know what I mean. I’m one of those people who doesn’t mind cookbooks w/o photos, so no biggie. Sounds like a great recipe — fave spice combo — and moist with all that applesauce. I feel your pain about what recipes go with which drafts/photos. I’ve been trying to use Evernote to be more organized, and so far, it’s working. We’ll see. Kellypea, this cake was moist and flavorful…it did not last long in our house and there are only two of us. Maybe if I hadn’t been so busy stuffing it in my face I could have taken a photo of it. Oh man, if only I had been around last week, I could have shared my pictures of this cake. I love this cake! Thanks for reminding me. The sheer number of blog posts I have to write about France is a little terrifying right now. Especially since my brain thinks it’s midnight right now. Beth, I owe my relationship with this cake to you. Hope you had a fantastic time in France. Can’t wait to read all about it.